If these students produced this app in high school, I can only imagine what they'll be doing in the next 3-5 years. Vena Solutions, the fastest growing provider of cloud-based corporate performance management (CPM) software, is proud to congratulate the team of two 15-year olds behind Emerg Master, the winner of this year’s Kiss My App national mobile healthcare app contest for students. A panel of expert judges from the healthcare and technology sectors named Emerg Master the winner of the contest, open to high school, post-secondary and post-grad students from across the country. 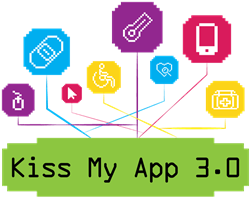 Now in its third year, Kiss My App is hosted by the Central West Community Care Access Centre, Headwaters Health Care Centre and William Osler Health System. As the presenting sponsor, Vena Solutions will present the winning team with their $10,000 grand prize at the official app launch today at Etobicoke General Hospital. "We're very proud to support the contest and especially the winning team,” said Don Mal, CEO of Vena Solutions. “If these students produced this app in high school, I can only imagine what they'll be doing in the next 3-5 years." Emerg Master was developed by grade 9 students Caius Dobson and Jacob Luxton from Grey Highlands Secondary School in Flesherton, Ontario. Featuring interactive characters and gaming elements, the app was designed to help patients more easily navigate through emergency departments and community care services. "At Vena, we know first-hand how valuable and influential our youngest team members can be,” added Mal. They're clearly not just the leaders of tomorrow, but already the innovators of today." Emerg Master will be available for free download on Google Play as of today’s launch. For more information on the contest, including news releases, photos and videos, please visit http://www.kissmyapp.ca. Vena turns Excel into an enterprise-class business solution with a centralized database, workflow, detailed audit trail and more. With Vena, hundreds of leading global brands now get trusted numbers and insights – fast – without sacrificing the investments they’ve made in Excel templates, models and reports. Our customers use Vena for corporate performance management (CPM) applications including budgeting, financial close management, reporting, and automating other spreadsheet driven processes across and beyond finance. Vena is the fastest growing cloud CPM vendor, and the only one to embrace – not replace – Excel spreadsheets.